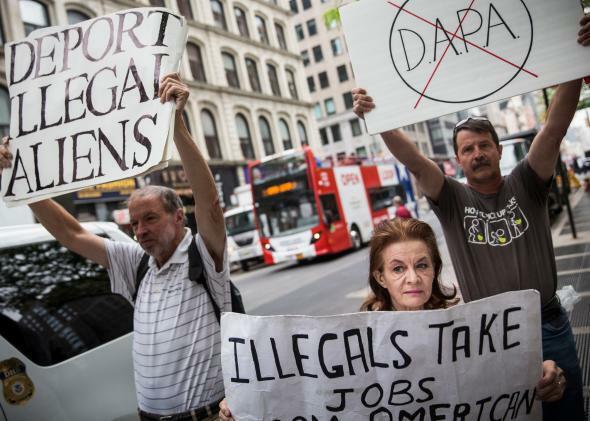 Obama's immigration executive action blocks by appeals court. Opponents of President Obama’s DAPA executive action make their voices heard. On Tuesday, the Fifth Circuit Court of Appeals blocked President Barack Obama’s immigration executive action—which would defer the deportation of undocumented parents of citizens and lawful permanent residents—from going into effect. The court held that the program (Deferred Action for Parents of Americans and Lawful Permanent Residents, or DAPA) likely violated federal law and the United States Constitution. Accordingly, it forbade the Obama Administration from implementing the executive action while it defends it in court. As a result, about 3.7 million undocumented immigrant parents continue to risk deportation. Ever since Obama announced DAPA in November of 2014, Republicans in right-leaning states have decried it as a lawless power grab. According to DAPA’s foes, the action illegally circumvents Congress and violates the president’s constitutional duty to “take Care that the Laws be faithfully executed.” Twenty-six states launched the current lawsuit as a preemptive strike, and persuaded conservative U.S. District Judge Andrew S. Hanen to bar any aspect of DAPA to take effect—anywhere in the United States. The Obama administration quickly appealed, and asked the Fifth Circuit to revoke Hanen’s order forbidding the government from implementing DAPA while it appealed the merits of the decision. Now the Fifth Circuit has refused, and the administration will likely turn to the Supreme Court to stay Hanen’s ruling and allow DAPA to take effect. As Walter Dellinger and Eric Posner have explained in Slate, the DAPA lawsuit is both extremely political and, on the merits, exceedingly weak. Through DAPA, Obama simply instructed the Department of Homeland Security to defer deporting the parents of American citizens and lawful permanent residents. 11.3 million people in the United States are deportable—but Congress has only provided law enforcement with enough resources to deport, at most, 400,000 a year. So Congress directed the secretary of Homeland Security to establish “national immigration enforcement policies and priorities,” thereby granting the president vast discretion over deportation policies. DAPA is essentially a policy statement declaring that the United States will prioritize the deportment of dangerous undocumented immigrants instead of responsible ones. The lawsuit against DAPA, then, is really more of a political squabble than a true legal conflict. A Democratic president, pursuant to a Congressional mandate, dictated a policy that deprioritized the deportation of the parents of citizens and permanent residents. A group of Republican governors opposed it. Their fundamentally policy-driven battle should play out in the political arena. Instead, it is playing out in the courts, drawing our increasingly politicized federal judiciary even deeper into the partisan fray.